When it was announced, GTA Online felt like the most exciting thing to ever happen to Grand Theft Auto. A GTA-style MMO had always seemed technically impossible; other developers’ attempts, like Realtime Worlds’ APB, had failed miserably. But the early demonstrations that Rockstar showed of GTA Online, of players organising grand crime adventures together from penthouse apartments with garages full of incredible cars, made us all think that the developer just might be able to pull it off. Actually playing Grand Theft Auto 5 in single-player, a game that I still can’t believe was possible on the previous generation of consoles, only heightened the anticipation. Of course, those first few weeks of GTA Online hardly lived up to expectations. I had the dubious pleasure of reviewing GTA Online in October 2013 and initially, it was a nightmare. Experience, cash and indeed entire characters could disappear at any point (many players had to start again multiple times, waving goodbye to tens of hours of progress). Enormous server demand meant that the early missions were almost impossible to actually play, and ridden with glitches. The in-game economy did not make sense. Even by the standards of online-game launches, Rockstar had a rough time of it back in October 2013, releasing constant updates and apologies via its Support and Newswire sites. You can only imagine what it must have been like on the ground at Rockstar North. GTA Online today is recognisable, but only just. 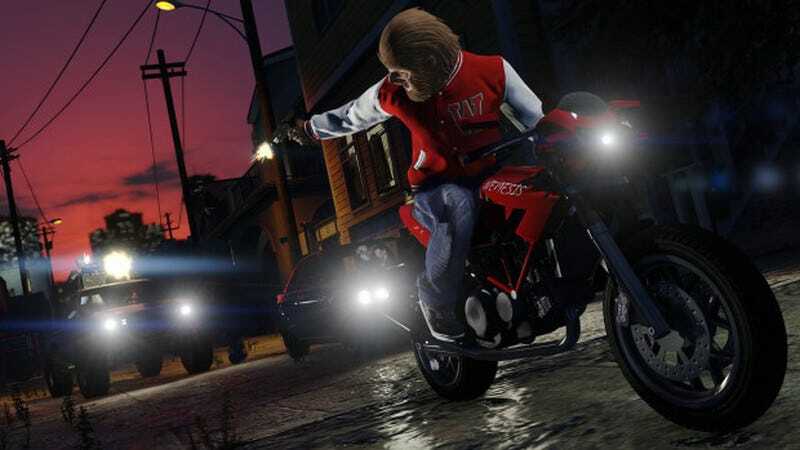 The buggy chaos of the launch period is a distant memory; the basics work perfectly, and Rockstar has spent the last two years adding different modes, mission types and items that broaden what GTA Online has to offer. Players, meanwhile, have been using the creation tools to make their own contributions - over 18 million of them. Next week, Freemode Events- the biggest change to the game since the eventual introduction of heists in March this year - will give players more to do in Los Santos outside of the Rockstar-and player-created missions. It has gradually evolved into a bigger and better online world, with more structured things to do outside of the freeform open-world shenanigans that Los Santos invites, though it’s still those free-form shenanigans that are my most memorable experiences in GTA Online. I fondly recall escaping into the mountains with a friend after a liquor-store robbery gone horribly wrong, with something like 30 police cars behind us, desperately trying to shake a 5* Wanted rating. There was the time my pal Keith attempted to rescue someone stuck on a ledge and ended up accidentally destroying their helicopter and stranding them there. I’ve spent hours tooling around on bikes in the countryside, finding weird corners of the map that appear to have no express purpose but have nonetheless been crafted with the same attention to detail as anything else in Los Santos. Another friend invented a game where everyone stands at the top of a river, then dives in and ragdolls all the way to the sea. First one there wins. Rockstar North’s president Leslie Benzies has said before that GTA Online has been an idea - a dream, really - at Rockstar since GTA III. “This started when we began making GTA III, and every single game we’ve said, ‘Right, now we’re going to do it, now we’re going to do it,’ and I guess we’ve never felt like we’ve had the manpower or the tech power to do it,” he told the now-defunct CVG back in 2013. Rockstar is tight-lipped about the early stages of development, however, and my questions about its prototypes went unanswered. We’ve evidently reached the limits of those constraints now with the new Freemode Events update, which is only coming to PS4, Xbox One and PC - though after two years of free updates, Xbox 360 and PS3 players shouldn’t feel too hard done by. The new hardware has created more opportunities for Rockstar North to play with: “with the release of the newer PS4 and XB1 hardware as well as the PC version, things really began to open up for us with first person perspective, increased player counts, the addition of the Rockstar Editor and many more opportunities we have yet to tap into,” Imran says. For a lot of new players to GTA Online, griefing has always been the biggest problem. It’s difficult to get around in Los Santos amongst strangers without someone trying to ruin your day - but then, you wouldn’t expect much else from Grand Theft Auto, which has always encouraged and thrived upon violent anarchy. I once started a new character on PS4 when that version came out and when I walked into a clothes shop, as the tutorial dictates, someone parked their car outside the door so I couldn’t leave and stood on top of the hood flipping the bird at me. This was funny enough that I wasn’t enormously pissed off - but he stayed there for nearly an hour, as I got on with other things, occasionally checking in to see whether he’d gotten bored yet. Rockstar’s answer to this was the Mental State stat, introduced in May 2014, which essentially makes you a more valuable target depending on how many people you kill or cars you destroy. More insane players are matched with other psychos in Freemode. But that wasn’t enormously popular with many members of the community, because the Mental State level increases even if you’re just trying to defend yourself (and doesn’t stop people from trapping you inside shops with a car, as far as I can work out). Rockstar does seem to listen to feedback, though - when the bike and motorbike physics were changed in an update, they were swiftly changed back after players complained that the less realistic handling was better for stunts. Imran’s favourite change over the course of GTA Online’s lifetime so far has been none of these smaller changes, though. “There are many improvements that the team are proud of, but the first-person mode within GTA Online really changed things for us,” he says. “It really is like playing an entirely different game. Just cruising around the world in first person with a friend in the front seat is such an amazing experience. Two years of GTA Online has clearly been an enormous learning experience for Rockstar. There are other persistent online words on console now, like Destiny and Final Fantasy XIV, both of which also have enormous resources behind them, but there’s nothing else out there quite like GTA Online. It can be chaotic and serene, serious and absurd, hilarious and sometimes frustrating. With Heists and Freemode Events in place, the game now closely resembles what we all imagined back in 2013, but there are still so many more places for it to go. The addition of new cities, perhaps set in new countries, still has the potential to absolutely transform GTA Online, though given how much work goes into every content update (remember how long we waited for Heists), that might be an impossible dream. Then again, Rockstar has always been a developer with stratospheric ambition.